On March 5, 2009, a bomb attack target­ed Rahman Baba’s mazaar, in the outski­rts of Peshaw­ar, in Hazark­hwani. On March 5, 2009, a bomb attack targeted Rahman Baba’s mazaar, in the outskirts of Peshawar, in Hazarkhwani. This attack and the blast in Meena Bazaar later that year which killed more than 100 people, are the ones people in Peshawar recall with the most intensity. Rahman Baba (1650 – 1717) was a Sufi poet revered not just in Khyber-Pakhtunkhwa, but in the entire country as well as in Afghanistan. The Afghan government reportedly even offered to pay for the mausoleum’s reconstruction. However, the shrine is now being rebuilt and devotees have started returning, though not in the same numbers yet as before. Another sign of the shrine’s recovery was the urs that took place this year, despite it being under construction. A two-day mushaira was organised by the Rahman Baba Adabi Jirga at the shrine and a seminar was organised at the Iranian Cultural Centre in Peshawar. The jirga has also been consulted in the reconstruction of the shrine. 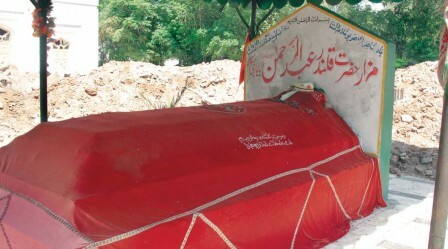 At the site, only Rahman Baba’s grave remains untouched. While Laiq admitted that “no material can be bomb proof,” he added that they are planning to fortify the new structure against any future attacks. Other security arrangements include a police checkpoint, and one police officer was on duty in the morning as construction was underway. Workers milled around the site, planting girders and layering cement, while the air was fragrant with the incense burning in mounds of rubble. The library features over 5,000 books, culled from book stores and donations, and is visited by devotees and students. “We are confident the shrine will be rebuilt in a year, and the new security arrangements will ensure nothing ever happens again,” said the chairman of the Rahman Baba Adabi Jirga, Yusuf Ali Dilsoz. Published in The Express Tribune, June 26th, 2010. At least eight people were killed in yet another flash of the gang war in Lyari. Urs at Bari Imam was cancelled the second time in a row disappointing devotees coming from all over Pakistan. One policeman was killed and three others critically injured when devotees of a shrine in Golra Sharif opened fire on police. Taliban militants blew up the shrine of Mian Umar Baba in the jurisdiction of Chamkani police station early on Monday.